BARN OWL HOUSE: Constructed of both plywood and cedar, these are houses which mount on trees or buildings and are designed to house barn owls. 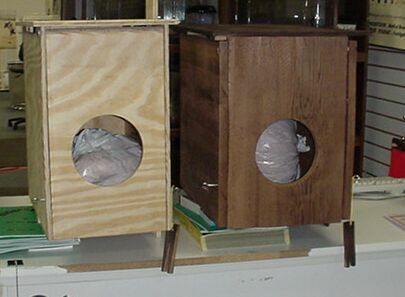 Both designs have several features which are important if you want an environment which barn owls like and will readily take advantage of when offered. Both have the same dimensions. Each stands 18" tall and is 18" deep. They are 11" wide and have a roof which overhangs the house by about an inch on each side so it will provide shelter from rain and snow. Both homes feature Plywood roof tops since the Plywood will wear much better in the rain once sealed and painted. The Cedar tends to crack and allow water to enter – something that will make any owl leave in a hurry. For this reason alone Plywood is used for the top and the bottom of both homes and will last a lot longer. WHERE TO USE IT: Though generally on a tree about 10 feet up, Barn Owl Boxes have been known to attract occupants when mounted on houses and other buildings. They can also be mounted on telephone poles, bird feeding stations, etc. PACKAGING AND COST: There are two styles shown in this picture. The one on the left is the Plywood house and is comprised completely of plywood. This structure will prove to last about the same as the Cedar home but cost is less due to the less expensive wood needed for construction. Plywood homes can be painted any color and should be sealed on the outside only to protect them from water. The Cedar built home, pictured on the right, is the same exact dimensions and construction design as the plywood. However, it uses all cedar except the roof and bottom. These parts are made of plywood since the plywood lasts so much longer than cedar. 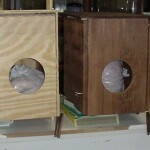 However, the rest of the home uses cedar which is stained a dark brown as shown.